NCRA members Andrea Couch, RDR, CRR, CRC, and Anissa Nierenberger, RPR, CRR, CRC, CRI, are the owners of a new captioning company, IdaCaption, located in Boise, Idaho. IdaCaption provides on-site and off-site CART and broadcast captioning services. Currently resides in: Ocala, Fla. Graduated from: Jones Business College, Orlando, Fla.
JCR | Why did you decide to earn an NCRA certification? 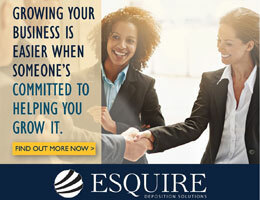 business partner and I felt it would help market our firm being certified. little about what you’ve done and how it affects your perspective about the profession? PHILLIPS | I have chaired NCRA’s National Committee of State Associations; chaired Constitution & Bylaws Committee; chaired the Committee on Professional Ethics; been a member of the Council of the Academy of Professional Reporters (or CAPR); and served on the Nominating Committee. 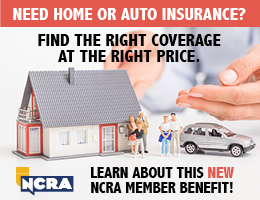 I have learned from every committee I have ever served on within NCRA. I have never been just a dues-paying type member. I am one to always be involved. 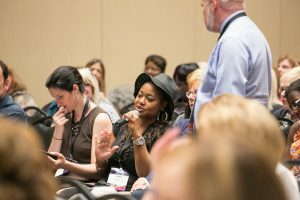 Being involved helps you to become a better advocate for this profession. It keeps you current on the changes in the industry and how to keep yourself viable within the industry. It has also allowed me to network with a lot of reporters, and I have made many lifelong friends. JCR | Do you have any advice for students in school and people who are just getting out of school? PHILLIPS | My one piece of advice I cannot stress more to students and new reporters is to learn time management. If you are not an organized person, get organized. This business will provide enough chaos, and if you are organized (if only in your professional life), you will be ahead of the game. JCR | Why was it important for you to earn the RMR certification? PHILLIPS | After receiving my RPR, the next natural progression was to attempt the RMR. It is important to me to challenge myself to improve my craft and aim for the next level. JCR | Why do you think professional certification is important? PHILLIPS | I believe it’s important to keep achieving the next level. Even if your clients don’t know what your certifications mean, other reporters definitely will, and they respect your level of achievement. JCR | What would you say to encourage others considering professional certification? PHILLIPS | I received my RPR 10 years after I started reporting and received my RMR 9 years after that, so 19 years after I first started reporting. I encourage reporters that you don’t have to have just finished school to attain these advanced certifications. Just practice, and you will reach your goals. JCR | What has been your best work experience so far in your career? PHILLIPS | What I love about court reporting is my work experiences change every single day. We are exposed to so many different things that I never even knew existed; or if I did know about them, I’ve learned more about them. Some days are more interesting than others, but it’s always interesting. PHILLIPS | In 1996 I took a leave of absence to do a home therapy program with our son. Before then, I went to work every day and pretty much was just going through the motions. During my leave, I realized how much I loved reporting and how much I missed it when I couldn’t do it. After my leave is when I got involved in my state association in Florida and then NCRA. It was then that I realized I didn’t just have a job, I had a career. I had a renewed love for court reporting. PHILLIPS | In 2015, I was awarded the Emily Mann Distinguished Service Award from the Florida Court Reporters Association, and I also became an NCRA Fellow of the Academy of Professional Reporters (or FAPR). Receiving these two distinctions from one’s peers was very humbling. For them to acknowledge all I had contributed to the profession — that was very rewarding. Of course, I haven’t done all I have done for both associations for the recognition; I do it because I have enjoyed and continue to enjoy doing it. 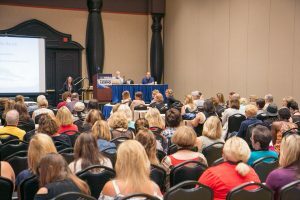 Following one of the NCRA Firm Owners Executive Conferences, attendee Robin Smith decided to take steps on an idea she had earlier brushed aside. Encouraged by a comment, she decided to approach a second court reporting firm to see if the owners were interested in merging. The JCR asked Smith and business partner Gail McLucas, RPR, to take us through their process. Smith, although not a court reporter herself, grew up in a court reporting family. She found the business side of court reporting fascinating, and with a degree in business management, became an integral part of her family’s business. JCR | How long have you been going to the NCRA Firm Owners Executive Conference? SMITH | I attended two Firm Owners conferences, one in Sarasota, Fla., and one in Dana Point, Calif. They were several years ago; and while I don’t remember anything specific, I do remember appreciating the opportunity to meet other firm owners and realizing that we all face similar challenges. I attended the conference in Arizona last year, and Gail and I both attended this year’s conference in St. Pete Beach. I found the conference this year very worthwhile — lots of opportunities to network as well as practical and useful business knowledge. We came away with the realization of two things that we can do better and have begun to take action on them. MCLUCAS | This year’s Firm Owners convention in St. Pete, Fla., was the first Firm Owners convention I’ve attended. JCR | What was the impetus for the merger of your two firms? MCLUCAS | It was spring of 2013 when Robin called me and asked me to have lunch with her. The purpose of the lunch was ultimately to discuss the possibility of merging our firms; and upon hearing it, I considered it a wonderful idea. JCR | Can you give a little bit of history about your firm as well as the history of the firm you eventually merged with? SMITH | Geiger Loria Reporting was started in 1950 by George Geiger (my stepfather). He was an official for Dauphin County in Harrisburg, Pa., and started a freelance firm as well. Virginia Loria (my mother) joined him in the early 1970s, and so we are a court reporting family. Both my sisters, Helena Bowes and Sherry Bryant, are court reporters. Except for me. I’ve always done the business side of things. MCLUCAS | I graduated with an Associate’s Degree in Court Reporting in June of 1974. From then until the end of 1980, I worked as an official at York County Courthouse. I started working for Geiger Loria in January of 1981. My former business partner, Joyce Filius, and I both worked together at Geiger Loria Reporting Service from 1981 until 1983. We were both from the York area, which is about 40 miles south of Harrisburg, and at the time we saw a need for a court reporting service in the York area. So Filius & McLucas Reporting began in August of 1983. JCR | Robin, how did you approach Gail with your idea? SMITH | You know how you have an idea and you think it’s great at first and then you talk yourself out of it? That’s exactly what I did: I talked myself out of it. It wasn’t until I was working with a business consultant and mentioned that I had this idea once and dismissed it. Well, he didn’t. He encouraged me to set up a meeting with Filius and McLucas and, as scared as I was, I did. 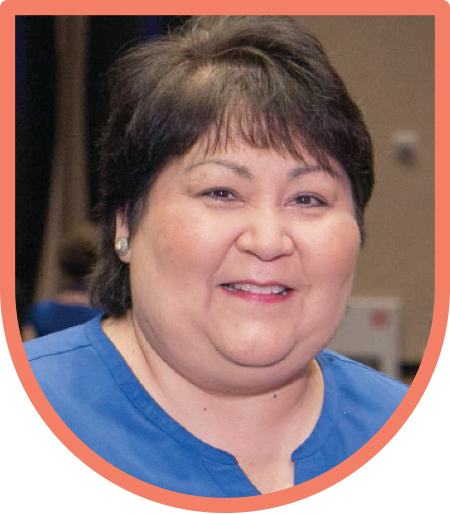 MCLUCAS | I was kind of curious about the call for lunch from Robin; however, we would see each other every so often at PCRA luncheons or events. But there was never an ongoing meeting with each other outside of that. But when the idea of a merger was presented to me, I was absolutely thrilled about the whole idea. I knew my business partner, Joyce Filius, was looking to retire and I certainly wasn’t ready to make that move in my life. I, too, have always been a firm believer in there’s force in numbers. So the idea of bringing two firms of comparable size together seemed to be a wonderful idea to me. JCR | What were some of the issues that you had to work out to make the merger happen? SMITH | Everything! After a lot of discussion, we decided to start from scratch, create a whole new company with the four of us as owners (myself, Gail, Helena Bowes, RPR, and Sherry J. Bryant, RPR, CRR) and wind down operations of our current companies. Then things became easier to figure out. There are so many things to consider and so many things you didn’t think to consider. It was a very hectic time. MCLUCAS | I think the initial decision that needed to be worked out was whether there was actually going to be a purchase of assets by one company or the other or a mere “merger” of the firms without the exchange of purchase money. When we discussed the assets that each company had accumulated over the years, we found that we had enough to put together two “households.” After all, a merger is almost like a marriage. We had enough to comfortably supply two office spaces (one in Harrisburg and one in York). Each partner put a small amount of capital into the firm to get it up and running and applied for a line of credit to initially cover payroll and some of our start-up costs. Of course, a name for the new venture is always a consideration. And although it’s a mouthful, we decided to keep the two names of the firms and just run them together because they were well-recognized in the area for over 30 years. JCR | How long did it take to merge the two firms? MCLUCAS | We started talking in the spring of 2013 and were hopefully going to have it culminate in September 2013. At first, we had a business consultant involved. But we were not getting answers very quickly from him, so we took it upon ourselves to make the merger happen on our own. 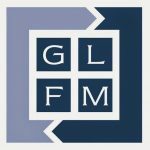 That, of course, involved a little more time, and we actually began the merged company, Geiger Loria Filius McLucas Reporting, LLC, on January 1, 2014. SMITH | From that point, I feel it took two years until everything started to gel. The first year is just a blur. We had to put out a lot of fires and just hang on for dear life. The second year, things started to even out, and we could begin to focus on the bigger picture. 2018 will be our fifth year together, and it’s gone really, really fast. JCR | What are some of the benefits of merging? MCLUCAS | I feel the benefits of merging were immense, although scary at first. We were bringing the reporters of the two firms together for the first time, who had been with each of us for 15 to 20 years. Like a marriage, we weren’t too sure how all of our “children” were going to get along. But the benefits have outweighed our fright, and overall the merger has given us a bigger and stronger firm than we both had separately. Also, because I’ve always been “just a reporter,” I really appreciate Robin’s business acumen and her contribution in that respect to the newly-formed company. I always enjoyed the client contact and reporting aspect of the business, but not so much the financial side and forethought that it takes to run a truly successful business. SMITH | We are stronger together. Together we have more resources, and that helps us to handle the ups and downs of not only day-to-day things but the ups and downs that are inherent in any business and industry. JCR | Were there any obstacles that you had to deal with after the merger was completed? Were those things that you knew about in advance and had been prepared for, or did they take you by surprise? MCLUCAS | As with any new business, there are always obstacles that you are presented with and have to deal with on a daily basis. The biggest initial obstacle was we moved not only the Harrisburg office, but we moved the York office (and may I say three times) before we were finally settled in. We were lucky enough to keep the office manager that was with F&M for 22 plus years, and that was sincerely a stabilizing factor for both of us. The building we moved into in January of 2014 didn’t have a permanent space for us until the middle of February. So we moved in February to a space, only to find that within a year we quickly outgrew that space and needed to move to a larger suite in the same building that we have been in since. The other big hurdle that I think every new business faces is finances. We had a substantial amount of start-up costs; and until all our clients settled back into working with us together, it was a little rough at first. But I don’t think any of this took us by surprise; it was just learning how best to deal with the circumstances we were dealt. And as they say, if it doesn’t kill you, it will only make you stronger – and stronger I feel we are today! SMITH | I wholeheartedly agree. Because we chose to start from scratch, the financial side of things probably was our biggest obstacle. We were spending money before we even opened our doors; and that took longer to recover from than we had anticipated or planned for. JCR | Was there something specific about the situation that made it seem like a good idea to merge? Are there conditions that you could describe for someone else so that they might recognize a similar situation? SMITH | The way we operated our firms on a day-to-day basis was very similar, our values and commitment were closely aligned, and we were in different regional markets so we each brought a different client base to the new firm. MCLUCAS | I think the main thing that made it seem like it was a really good idea was when we compared financial information. It was like holding two identical companies side by side. But as in running two households, running two businesses is always more expensive than one good, strong one together. For me, that is what really made the situation seem real and that it was a good decision to be made. I think the partners also have to recognize whether they will be able to work together amicably and not have one be so overpowering as to not consider the other’s opinion. As partners we’ve been able to communicate openly about all things involving the business, and there are no secrets kept from anyone about anything. I think an open and informed relationship is the only kind to have. JCR | Is there any advice that you would offer to someone who is interested in merging two firms? SMITH | I think it’s important if you’re going to be essentially handing over your business to someone and they are handing theirs to you and you’re going to be working together, that you like, respect, and trust that person. I’m not sure that’s something that I consciously thought of before we started down this path, and I realize now how important that was and still is. MCLUCAS | I would say the most important factor is getting to know your potential partner as well as possible. Robin and I set regularly scheduled meetings with each other over the course of nine months before we finally made the merger happen. I hate to keep likening this merger to a marriage; but if you don’t have common goals and ideas as the person you’re going into business with, it could turn out to be a disastrous idea and will only cause heartache and failure. However, 2018 will be our fifth year in this merged company together and I couldn’t be happier with how everything has turned out for the two firms. I’m almost positive [that we] would not have been as successful if we had stayed two separate firms for this period of time. Many reporters and captioners are freelancers or small business owners, which often means working from home at least part of the time. 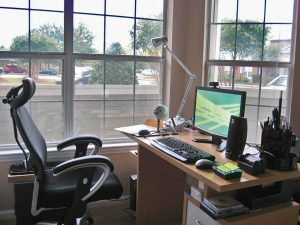 There are many aspects to working from home, but first you need an actual place to work: a home office. Depending on the setup of your house, that space might mean a more nontraditional room, like a loft, where Sabrina Trevathan works. Trevathan, RDR, is a freelancer in Rawlins, Wyo. After having the physical space picked out, the next step is making sure you have all the equipment, both for doing the job and for running the business. Every professional interviewed for this article emphasized the need for a comfortable chair. “Invest in the best because you deserve it with how much you sit, and your body will thank you later in life,” said Donna Linton, RMR, a freelancer and captioner in Ashburn, Va. Of course, make sure you have a desk to go along with that chair, and think about what else you will need to store. You can have a simple space with shelves or turn it into your dream work space. “I had [my office] built out by Closets by Design specifically to my needs, i.e., how many computer stations, where the printer would be, cubbies for different size transcript binders, where the paper would be, and where my machine case would fit,” said Linton. Working from home means being able to run a business, so make sure you have all the necessary software and supplies. Consider having a word processing program like Microsoft Word (or the entire Microsoft Office suite) and accounting software like QuickBooks, and of course, make sure you have up-to-date CAT or captioning software with tech support. 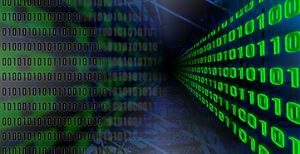 Think about cloud or digital storage along with physical storage. Pruitt also uses Wondershare and Adobe Premiere for video editing and has projectors, screens, and lighting. Trevathan lives in a rural area, so she needs to make sure she has access to all the supplies she needs – it’s not easy to just run to the store. These include binding combs, transcript covers, index and exhibit tabs, copy and printer paper, a schedule book, address labels and different sizes of mailing envelopes, and extra toner. Linton has two whiteboard calendars, a speakerphone, and a fireproof safe to store exhibits. And don’t forget the basics like pens, paper clips, a stapler and staples, etc. If you work from home, you may be able to claim your home office on your taxes. “My CPA figured out a percentage of how many square feet my office is and writes off that same portion of my utilities,” said McGhee. Your accountant should have a formula to determine how much the write-off actually is, and don’t forget to ask about additional spaces like an adjoining bathroom, storage space in another part of the house, or any other area that’s designated as work space. However, having work nearby in a home office is both an advantage (can’t beat the commute) and a disadvantage. “Sometimes you feel like it’s hard to get away from work,” said McGhee. Trevathan echoed this: “I always feel like I need to be working and never leave work. I’ll run upstairs to the office to return a phone call and end up working on transcripts for an hour before I even realize it.” Perhaps English has figured out the trick, however, to maintaining boundaries. “You can walk out and leave the work behind,” she said. Having a dedicated space for work can mean literal help with compartmentalizing, so when you close the door, you leave the work at work. Equifax announced in September that they discovered a data breach on July 29, that occurred mid-May through July, which affects 143 million Americans. The hackers were able to access the Equifax data through a security flaw in the Equifax website. In a Sept. 7 post on krebsonsecurity.com, security expert Brian Krebs said, “Equifax may have fallen behind in applying security updates to its internet-facing Web applications. Although the attackers could have exploited an unknown flaw in those applications, I would fully expect Equifax to highlight this fact if it were true – if for no other reason than doing so might make them less culpable and appear as though this was a crime which could have been perpetrated against any company running said Web applications.” The Fort Knox of our identity information was asleep at the wheel. While this isn’t the largest breach, it’s one of the most serious because the hackers accessed names, social security numbers, birth dates, addresses, and driver’s license numbers. These are the essential elements to take out loans, open credit-card accounts, and more. Visit equifaxsecurity2017.com to find out if you were affected by clicking on the “Potential Impact” button. Make sure you are on a secure computer (not a hotel or public computer) and are using a secure internet connection (not a public network like a local coffee shop, etc.). Equifax is offering free credit monitoring, identity theft insurance, and other items for those affected. I have always had credit monitoring so that I receive alerts in balance increases and decreases, new accounts, and credit inquiries. If you do not have a system of monitoring in place, I would strongly suggest you do so. Christine Phipps, RPR, is a freelancer and agency owner in North Palm Beach, Fla., and a member of the NCRA Board of Directors. She can be reached at christine@phippsreporting.com. In 1996, Tera Walker was a former court reporting student working as a flight attendant for United Airlines. She’d just launched a reporting company called Steno Scripts and had sent a proposal “to every awards show,” she said. The Oscars contacted her because they didn’t understand what exactly she was proposing to do. Walker grabbed a couple of court reporting students and drove to Beverly Hills to demonstrate. They wrote about seven to ten minutes of The Usual Suspects with Kevin Spacey, cleaned it up, and printed it out. Walker recounted with a laugh that the transcript was still pretty messy, but the folks at the Oscars didn’t read it — they were impressed with the quick turnaround. At the time, individual journalists in the backstage pressroom would have tape recorders during the interviews. The result is easy to guess: The celebrities were often misquoted in the next day’s newspapers, and their publicists weren’t thrilled. Now, Walker and her team produce one verbatim transcript that gets distributed from the Academy of Motion Picture Arts and Sciences (AMPAS) to the media. 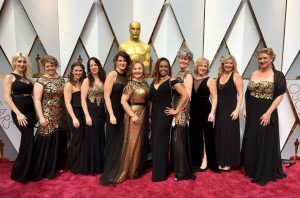 Getting called to work the Oscars is a good example of “it’s who you know.” Both Sjoquist and Diane Rugh, RMR, CRR, a freelancer in Snohomish, Wash., got the job via Jeff Cobb. “He knew I had moved to California, but wasn’t sure where,” said Sjoquist. “Jeff was working with Tera Walker at that time, and the team needed a reporter to fill one of the spots.” He reached out to her asking how close she was to Hollywood. The team is a mixture of veterans and newbies, but after a couple decades, there’s a definite system. “After working the Awards for as many years as I have, the best part about it is being with the team,” said Sjoquist. “Our team is like family that I get excited about seeing and catching up with every year.” Team members travel from California, Washington, North Carolina, and Virginia. “We’ve turned Oscar Sunday into an Oscar weekend, usually beginning Friday evening, where we make sure we have time to visit, socialize, and have fun with some crazy activity before work on Sunday,” said Sjoquist. Preparation for an assignment like this begins with ensuring that equipment is in working order and gathering information. “We are required to have the latest update on our software,” said Sjoquist. “The day prior to the Oscar broadcast, we meet with the Academy personnel to go over the layout of the room, make sure internet connections work, and confirm the reporters’ audio and page layouts,” said Wallat. Perhaps the most fun part of prep work? “Find a dress and shoes!” said Wallat. Despite the fast-talkers, the long hours, and the pressure to deliver, working the Oscars provides memorable moments unlike any other assignment. “The writers and notetakers sit in the front row, about 3 feet from the stage where the winners are standing. We are so close to the winners that one year, one winner, Jared Leto, actually handed me his Oscar so that I would confirm how heavy Oscar really is,” said Sjoquist. I shuffle awkwardly in my black pumps as the floors tick by one at a time – ding, ding. The stainless steel elevator doors make a poor mirror as I try to sneak a peek at my reflection to adjust those pesky fly-aways that the wind’s kicked up. Propping my sunglasses on my head instead, I try to imagine that they serve as a perfectly good headband. “Do you solemnly swear — swear or affirm to tell the truth, the whole truth, and nothing but the truth, so help you God? No, no. Drop the whole God part.” I rehearse the line again and again in my head, imagining I’m delivering the affirmation while another part of my brain imagines unloading my equipment in the room: tripod, then machine, then laptop, then cables. Yup, cables definitely last. When I walk up to the receptionist with my best “I totally know what I’m doing” smile, I imagine that I don’t have a run in my tights from grazing my roller case just minutes earlier. I imagine I’ve done this a million times before. I’m pretty good at imagining. After all, it’s what I’ve done all through court reporting school. And now I’m finally here, about to take my first deposition. Fake it until you make it. Visualization. Mind over matter. Call it what you want, but it’s one of the key reasons I got through school. Since before my first day of theory, I had a very specific image in my head of what I would look like after my school career: pencil skirt, black pumps, roller case in hand. There would be tall buildings, cool elevators, and beautiful cityscape views from the windows. I’d be poised and articulate, and I’d take down the record with ease. My writing would be clean; my schedule, full. The Law of Attraction is the belief that focusing on positive or negative thoughts will bring about positive or negative experiences into your life. Visualizations power that Law of Attraction. Now, no one is saying that simply imagining something will magically make it come true. If you’re a student now or have been in the past, then you know that it takes practice, discipline, focus, and a whole lot of work to pass that final test. However, maintaining a positive spirit by keeping one’s eyes fixed on the goal is what makes all that work worthwhile. The weeks, months, and even years spent in front of the machine practicing won’t do you a lick of good if you don’t eventually reach your goal; you won’t reach your goal without a positive attitude; you can’t maintain that positive attitude without visualizing your goal. While there is no one answer to most students’ burning questions — How much should I practice? Should I shorten my writing or write everything out? What’s the fastest way to get through school? — the one constant among all successful graduates is that they had a goal and visualized it until it became a reality. Demoralization is, above all, the greatest threat to one’s success in school. Visualizing yourself as the successful court reporter you want to be is that imaginary carrot on a stick to help you get through the tough times, something to remind yourself why you’re sitting in front of your machine for hours. It makes the days you dedicate to memorizing briefs and scrimping and saving for the state association conventions worth it. Without that shining light at the end of the tunnel, it is easy to grow to resent the grind of school days. Painting a magnificent picture of your future can also have the added benefit of tricking yourself into success. In my later speeds when I hit plateaus, I would get frustrated, and then I would get imaginative. I pretended that I’d already passed that test and that the ten minutes of dictation were merely a warm-up. Sometimes it worked. Like imagining a plateful of delicious food to stave off my rumbling belly, that imagined confidence shrugged off nerves and left my apprehension at the classroom door so that I could tune out the negative self-talk and just write. Now, nearly a year and a half after I left school, has all my visualizing paid off? Well, I got my pencil skirt and pumps, but they’ll sometimes show runs in my tights or get scuffed. On the job, I’m sometimes poised and articulate; other times, I forget my own name. Sometimes my schedule is full, and sometimes it’s emptied by a rash of “cancellitis.” But that doesn’t stop me from still imagining. I’m always making new goals and focusing on them, looking forward to what I can accomplish next. Whatever your goals are, bring them to life with powerful visualizations. Get creative and don’t skimp on the details. The more vivid the image, the more potent it will be. These self-affirming visualizations will keep your head high when things get tough, they can help you relax during tests, and they will remind you what all your hard work is for. And just imagine what will come next. Katherine Schilling, RPR, is a freelancer based in Richmond, Va. She can be reached at katherineschillingcr@gmail.com.